MESA students showed Silicon Valley why they are the new and needed faces of STEM. Last weekend’s 13th Annual Student Leadership Conference gave 200 MESA students from across the state the chance to show off their leadership chops and hone new skills with industry representatives. All students attend workshops to bolster their interview skills, emotional intelligence, communications, self-promotion and other “soft skills” so critical to career success. MESA’s top industry partners fully sponsor the conference and are heavily involved in the planning and execution. Industry urgently needs a diverse, high-quality talent pool and almost two-thirds of MESA students are from historically under-represented ethnic groups. Pacific Gas and Electric, Southern California Gas Company, Edison International and San Diego Gas & Electric were the top sponsors with additional funding from CHC Consulting, Intel, Applied Materials and Jabil. Other partners included NASA, Tesla and AT&T. Students engaged in a number of creative activities designed to sharpen their professional skills. They competed in an elevator pitch challenge styled after the hit show “The Voice.” Audience members voted by live polling during this PG&E hosted competition. SoCalGas led a team-building Lego Challenge. And a networking social event included improv games geared toward enhancing social and emotional skills. More than 30 industry volunteers from Applied Materials, AT&T, CHC Consulting, PG&E, and SoCalGas spent their Saturday mock interviewing all 200 students. University of Phoenix provided materials for students as well as a workshop. MESA alumni and staff also networked with industry executives during a VIP reception sponsored by CHC Consulting and Applied Materials. 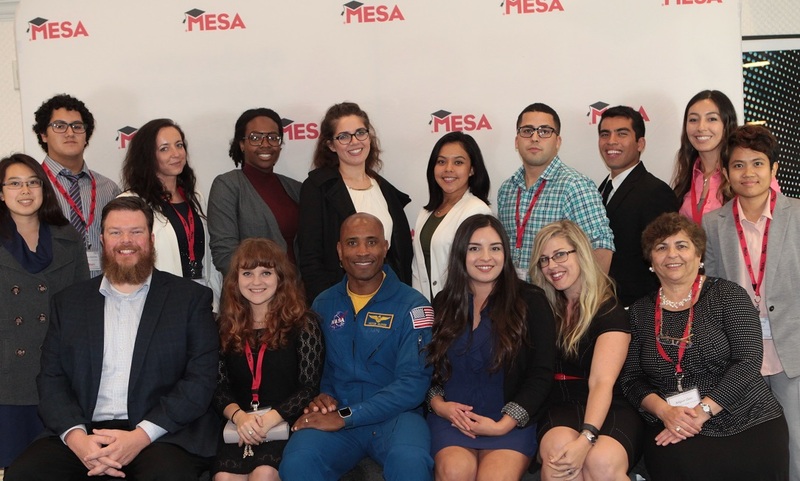 A hands-down highlight was MESA alum and NASA astronaut Commander Victor Glover’s moving and inspiring speech. He reflected on his time in MESA, encouraged students to become life-long learners and emphasized the importance of the work they will do in their careers. Glover’s educational path was chock full of MESA. He was a MESA student in grade school in southern California and while an engineering student at Cal Poly San Luis Obispo. As an undergrad he continued to give back to the program by tutoring MESA middle school students.